In yesterday’s post about Jackson architect Frank Fort, I bemoaned the lack of a portrait of the man with his obituary. 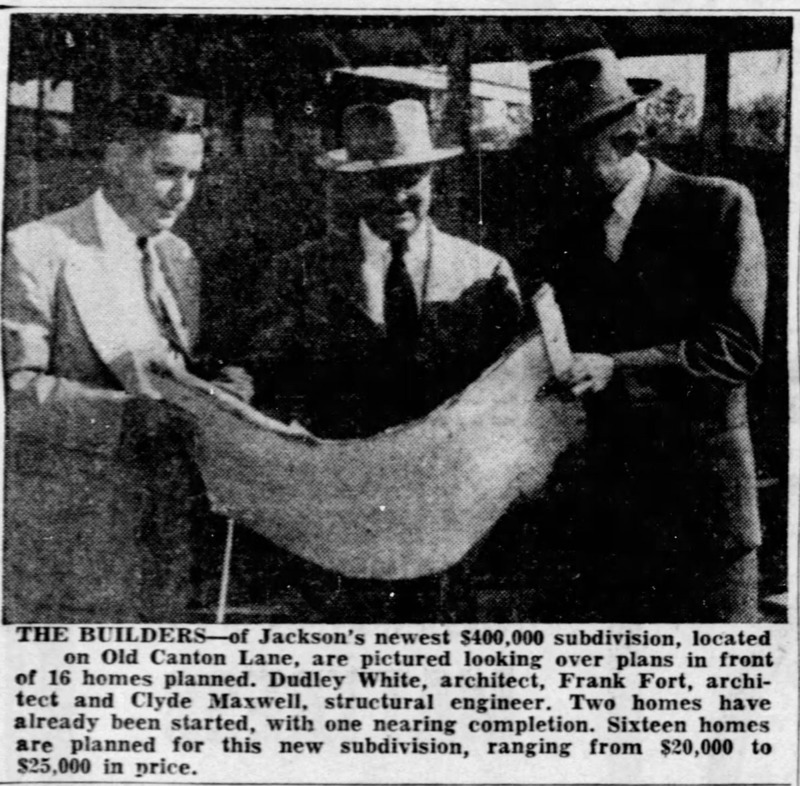 Ask and ye shall find because lo and behold here is a photo not only of Frank Fort (center) but also his partner Dudley White, and engineer Clyde Maxwell (unfortunately in shadow), who according to the article below designed all the reinforced concrete foundations on this street in Jackson, famous for its shifting Yazoo clay. The trio is examining plans for their latest subdivision, in the northern section of the Fondren neighborhood, which was one of Jackson’s up-and-coming neighborhoods in the 1950s. Plans have been completed for the development of Jackson’s newest subdivision, a $400,000 restricted, residential area located between Crane Boulevard and Meadowbrook, off Old Canton Road. Fort & White, developers, have announced that Old Canton Land, as the new street is named, has been approved by action of the city council. A new sanitary sewer line connection with the City sanitary system has been made and also an extension of the city water main. The street has been graded and paved. Frank Fort, of the Fort & White firm of architects and builders, said Old Canton Lane is 1,200 feet long and contains nine lots on each side of the street. Sixteen modern, three bedroom-two bath homes will be built on Old Canton Lane, to run in sale price from $20,000 to $25,000. The two corner lots on the Old Canton Road are not included in this development, Fort said, and are restricted to more expensive homes. “Each home will be designed to fit the site, with a wide range in style,” Fort said. Both traditional and modern design will be used in Old Canton Lane homes, he said. Clyde Maxwell, structural engineer, has been retained to make test borings of the soil and also to design all foundation work, Fort said. Only reinforced concrete foundations will be used. 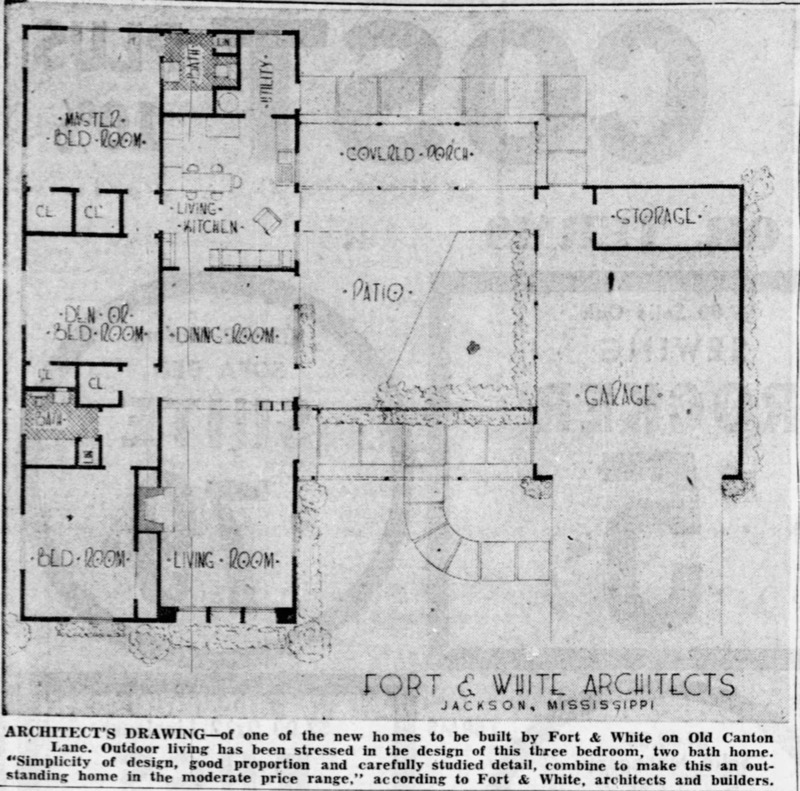 The firm of Fort & White built the first group housing project in Jackson, and since have developed four other subdivisions. The architectural firm served as land planners and supervising architects for Eastover. Fort & White designed 14 new homes that have been completed in Eastover. Try as I might, I don’t see any house on Old Canton Lane today that resembles this model and floor plan, which may have been on the too-modern side of the scale for most home-buyers and kind of has an oddly narrow plan and a detached garage and may not have been as desirable as the popular Ranch houses that now populate the street. There is one house – Google maps gives the address as 4016 – that has a similar shape. It seems to be the 4th on the left coming from Buckley. I wonder if it could be a modified version of this with the patio turned into a living area. It has a wide chimney over that part. There is a chimney on the main part of the house that doesn’t look original but seems to be in the same place as the model.